I’ve been making a lot of changes to my growing setup and would be grateful for any advice I can get on the ventilation especially if anyone is familiar with this size tent. Up to now I’ve been growing with LED’s in 2 DS60’s but I got rid of them all for this grow and bought a 120 x 60 with HPS lights so I could make better use of the space and equipment. I’m just about getting away with one 600w HPS using passive intake from the attic and 5” extraction to a vent also in the attic but temps hover around 30 so it’s borderline. The Prima Klima 125mm fan that I’m using for extraction has a temp probe on it so I was thinking of moving that to the intake so it could click in when temps hit the high 20’s. Then I’ll go get another, larger Prima Klima. I’ve never looked to adjust the speed so a 2 speed basic model will do the job fine. Thing is, what size would I need to move to make a big difference in temps ? Would a 150mm make a big difference or should I go bigger ? Just my 2c opinion, but I'd go lower wattage if I was putting a hps in that size tent - even if mostly for the heat issues. The nice canopy you have there doesn't look out of the reach of a 400W bulb, or hit up diyled and get a decent led in there if you want higher light volumes, I don't know if that's in your budget? 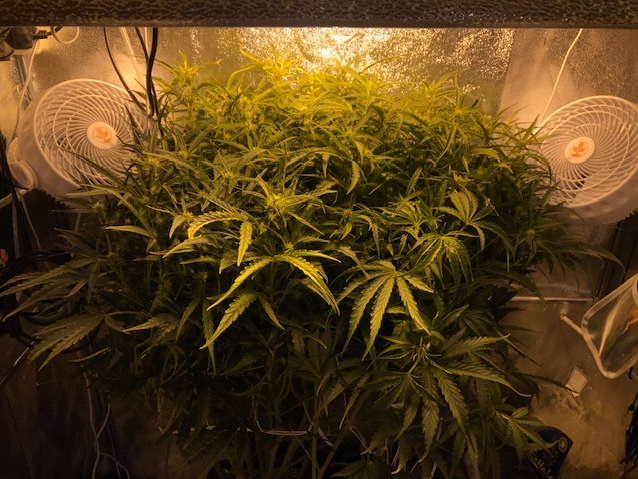 Yeah, the HPS is dimmable so I could get a 400w bulb handy enough but I’d feel like I was missing out on that 200w and it barely covers the canopy as it is. The temps are so borderline right now that I’m fairly sure I can get away with 600w if I have the ventilation right. Summer will be a problem and I’ll probably struggle to run 400w then but I’m thinking 2 good grows between now and then will sort that out. I’d spend the few quid on a good LED but I’ve just bought the HPS and I know there’s no excuses with them so I’d like to get a few good grows with them. At least that’s the plan anyway.. I agree that a 600w would be better suited to a 1x1m or even better 1.2x1.2m tent. If you are going to continue using the 600w in that tent then I'd say yes for sure get a decent 6" high power fan to get rid of the hot air. What is the CFM of your current fan? Also what is the height of your tent? Size of Carbon filter? Length of ducting run? Many bends? If you are drawing air in from loft it should be cold(?) depending on the type of loft you have. If it is cold then putting the probe in front of the intake will make the extract fan think it's cooler than it is. Edit: also what shade are you using? I’m clean out of space so have to work with what I have. It’s an awkward shape alright but it’s all she’s ever going to let me away with. The attic is not well insulated so coldish air in the winter but won’t be much use in the Summer. Right now I have 5” ducting running from a 5” filter straight up through the ceiling up to the fan and then pushed further in to a vent. It’s about 10m but only one bend. I can’t find the specs online but it’s a Prima Klima 125mm and moves quite a bit of air. The tent walls are always sucked in tight. Im using adjustawings enforcer. I have 2 of them and was getting a bit ambitious thinking about running 2 250’s but went off that idea from reading othe threads on here..
and edited to add add the temp probe will come down through the ceiling into the tent so will give a true reading..
Was going to suggest an adjust-a-wing in that space so that's all good. 2 250's sounds like a good idea to me as the spread would be better across the 1.2m but there might be other reasons as to not do that. Had a quick look at it looks like around 400cfm. I think a 6" high power RVK will shift around 700 at full boar. Is your fan running full pelt most of the time? My understanding is that ideally you would have shade temps of around 25/26c and 30c would be your canopy temps. Where is your sensor for temps? Taking air from loft should be bringing cold air in. My loft temp is currently 10c and my intake temps at 14.5 as I'm taking from a bedroom downstairs. My room temp is 25c and 6" extract is running around 44% I imagine. I am only running a 400w currently and in a 1.1x.12m room. I might be inclined to suggest bigger than a 6" if noise will be an issue as it's very possible you will be running quite fast on the 6" as well. 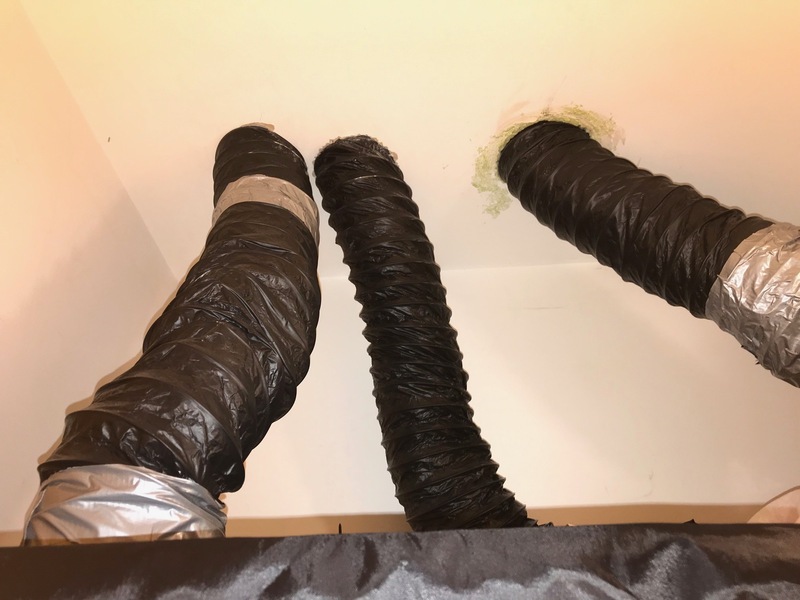 Stretching out the ducting as much as possible, reducing/removing any bends and shortening ducting run will help with airflow as well. Also I think using oversized ducting helps with airflow and noise as the fan has an easier time pushing air down. I know that when I went with my 6" I used 8" ducting for this reason along with noise. Someone else will be able to confirm/deny my ramblings though! I didn't see it that way - 600W should be pulling you around 20 oz (gpw), the grow you have their I do not think would yield 20 oz, so you are already below what a 600 can yield, in potential. A 400W would yield approx 15 oz - this would seem much more achievable within the space you have to work with. I'd think the 600 would also reduce your crop due to heat, I think you'd pull more with a 400, or a good led. As you've invested some cash to pull back I'd switch down to 400W for this grow and maybe the nxt, then get LED in their before it gets hot? Cheers that all helps a lot.. I bought the adjustawing after reading about them on here and it has made a massive difference to temps and light spread so it was a great purchase. I looked up the specs for my current extraction fan and was surprised to see it only moves 400m3/h which is a lot less than I thought. It’s been running at full tilt 247 for a year now so I’ll semi retire it over to the intake where I can set it up with the temp probe and it should have an easier time from here on in. My thermometer sits right at canopy height in the middle directly under the light so I think I’m catching the hottest point and it’s hitting low 30’s at the very max. It was 24c when I checked first thing this morning. I never would have thought of using larger ducting but it makes sense. I think I’ll go a another step up with the fan and get a 200mm which would move twice as much air as the current one on the higher setting. The lower setting will take me back to exactly what I have now so good to have both options. Noise isn’t really a problem as I hang it from bungee chords in the attic and the room is sound proofed. Also I think you're both on the money about running at 400w if that's all temps will allow. Up to now i've been focused on getting maximum spread of light at maximum wattage whatever the cost but I need to accept that I will have dead space given the shape of my grow tent. If I can set it up in a way that allows me run the 600hps at cool temps most of the time i'll be happy with that but I'd definitely rather take a small hit on yield with the 400w then take a double hit on yield and quality due to high temps. I'll only ever be able to run 400w in the Summer anyway. I'll be finishing up this grow in a couple of weeks and have 5 Dinafem Critical Cheese Auto's winging their way to me right now so i'll get a 400w bulb for that. I intend to use the Vipar Spectras for vegging anyway so should have plenty of time to sort out the changes in ventilation. Thanks you've both been huge help.. I've been giving this some thought and apologies again for the ramblings.. I had just bought a bunch of 125mm and 150mm flanges for the tent. I can only seem to buy them from one place in Holland and the shipping is crazy expensive so I try and buy a few bits at a time. I got a couple of repair kits and and a final corner flange unit which adds strength to the structure so good to have them on regardless of whether I intend punching holes or not. I have one on all of the front corners now. They're also a great way of sealing up the patches when needed. Anyway, I don't think I can get flanges any bigger than that so i'm thinking of getting a Prima Klima 200mm with 2 speed setting. Top speed would be 900M3/h. Bottom setting would be 400M3/h. I can buy a larger filter but could do without the expense just so now so was thinking of upgrading that in March (bonus time ) I would have to use reducers in and out of the tent but the rest would be 200mm ducting up through the ceiling, through the fan and a straight run to the vent. Under 10 meters in all. Question is, am I completely negating the new setup by restricting the access point to the tent to 150mm ? I know the filter would make a difference and needs upgrading but I can live with what I have for a month or 2. It's only a few months old and i'd prefer to wait and get a decent one when cashflow is better. I believe these changes, particulalry with the intake, will allow me comfortably run the 600w over 3, maybe even 4 plants in that tent and if I manage to achieve that with good temps i'd be very happy. Plan B will be to follow the advice above and swap between 400W and 600W depending on those temps but either way all I can see is the makings of a successful grow. Are you in UK? If so check out 'duct store' as they seem to have all ducting related things. I haven't ordered from there yet but going to be this week. Restricting down to smaller might cause the flow to reduce and noise to increase but if you are pulling 900 then it will be higher flow than what you have now. Are you limited to 150mm socks on the tent? Intake fans help with easing pressure on the main extractor but not much more, esp in tent your size. It just allows the fan to work easier as the air being replaced isn't all being sucked instead and some is blown in. Ensure you have neg pressure at all times by running extraction faster than intake. Site is great as I've also got no one in real world I can talk to so this is a good way to vent all the stuff I want to chat about! I believe you will still restrict the airflow to that of the narrowest point of pass - to get greater throughput you will need to increase the airflow throughout, from filter to the point it exits. I think of this as a band pass filter - you are applying a filter to the middle of your system that restricts airflow to x/per minute. That dictates the flow of air leaving the pipe, as you can't put anything more in than will pass. I had a similar situation when I tried to use one fan for two tents. As one tent is half the size, I used a 5" filter with a reversed reducer and a 6" fan on the other, joined with a Y split then fed into the box fan (it pulls the air). The 5" just sat there with zero air going through it - as the 6" had greater throughput the air naturally followed the path of least resistance. Pretty sure you will need to resize your fan & filter if you want greater throughput - someone may correct me on this. I'll check out that store as i'd like to find a discreet external intake for the Summer but that's another days work. I realise the intake won't fix every heat issue but i am borderline and so if I have a spare fan I may as well use it and it can't hurt. Ok thanks. That's what I figured. So I'm going go to go with the Prima Klima 150/160 which pulls 800m3/h which is still double what I have there now. That also sorts the flange issues on the grow tent as I have a few 150mm flanges ready to rock. I just need some 150mm ducting, a 150mm filter and a 400w HPS bulb and it'll all be working for the next grow. You've both been a massive help.. So I’ve ordered a Prima Klima 150mm filter with optimal flow of 700m3/h and max flow of 1150m3/h. Also ordered a Prima Klima 165 fan with max flow rate of 800m3/h. And finally ordered 10m of ducting and a 400w dual spectrum HPS bulb so I reckon that should be it for now. If I can run 3 autopots under the 600w and keep temps I’ll be happy. If not I’ll run them under 400 and be happy with whatever that yields..
Have some critical cheese on the way so will have a go at a diary on here when they pop. Just to add a quick follow up on this..
to pick up all these bits and after a long chat I walked out with nothing but a few secret jardin flanges for the tent and a length of ducting. They’re sound lads like that. They never try and stick the arm in or sell me more then I need. I went home and completely rearranged the ducting, removing all bends, kinks, extra lengths and improving all the seals at the access points in and out of the tent and shortening runs where possible. It made a massive difference and left the temps sitting at a steady and comfortable 25 to 27. I’ve since flushed them out with water for a week and have just harvested what looks to be a personal best yet in weight terms. Will have to wait a few more days to find out about quality.. I had already ordered 5 critical cheese autos and have 3 of them in the propagator so hopefully will get going again shortly and will do a diary on them from the get go. I’m in no rush for now though as the tent is being used for drying. I’ve filled a 60 x 60 and the 60 x 120 with bud so that has to be a good sign. Will add pics when dried and weighed.